Outdoors big screen TV ad display screens and LED advertising billboards have become as important part of the advertising mix. 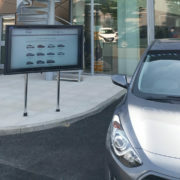 Advances in the design and production of flat screen TV display monitors are presenting small and medium sized business owners, marketeers and advertisers with outdoor advertising opportunities previously only available to larger companies or multinational corporations. Kim Menem, CEO of Aqualite Outdoor takes up the story. Why not advertise your company at an outdoor event, or broadcast marketing material throughout shopping malls, car parks, train stations? In addition, using Aqualite Outdoor displays for public information purposes can also increase efficiency and awareness.